Recently, I was introduced to to an artist whose artwork really hit me in a positive way. 山本四角 (YAMAMOTO Shikaku or Yonkaku, depending on which reading he goes by) is the artist’s name and modern fantasy is the name of his game. What I mean by this is having fantasy characters such as high elves, dark elves, oni, humanoid beasts, etc., and setting them in a modern context. Yamamoto-sensei has several scenarios set up, but his main three are quite interesting. First, there’s the High Elf Ojousama and her humanoid fox butler. She appears to have rescued him when both were young, and he’s served her ever since. She’s a mage of some kind and apparently a detective. The Man-Fox appears to come from a heritage based on American Indians, which I found most cool. Next up is the tomboy street musician (not sure what race she’s supposed to be) and the Man-Dragon. 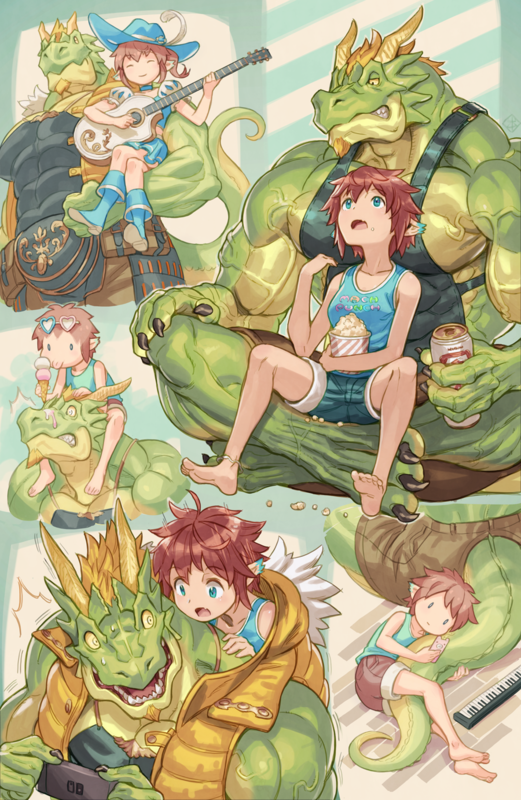 The Man-Dragon saved the girl from being beaten up by other beast-thugs. He hung around to hear her play and was so touched by it, he sang with her, causing her to gain quite a bit of tips as a result. Thus, the two are now inseparable. The artwork really appealed to me. In addition, I liked the idea of a fantasy world set in a modern context, where there’s electricity, smart phones, game consoles, HDTV, etc. I really, REALLY wish Yamamoto-sensei had more manga stuff out and that we could read it in English. 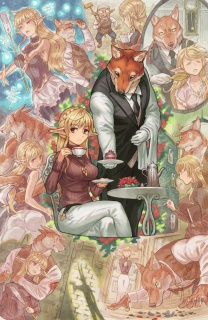 I’d love to read about the adventures a High Elf Ojousama Detective Sorcerer and her Man-Fox Butler. I’d love to seem more of the street musician tomboy and her Man-Dragon companion. 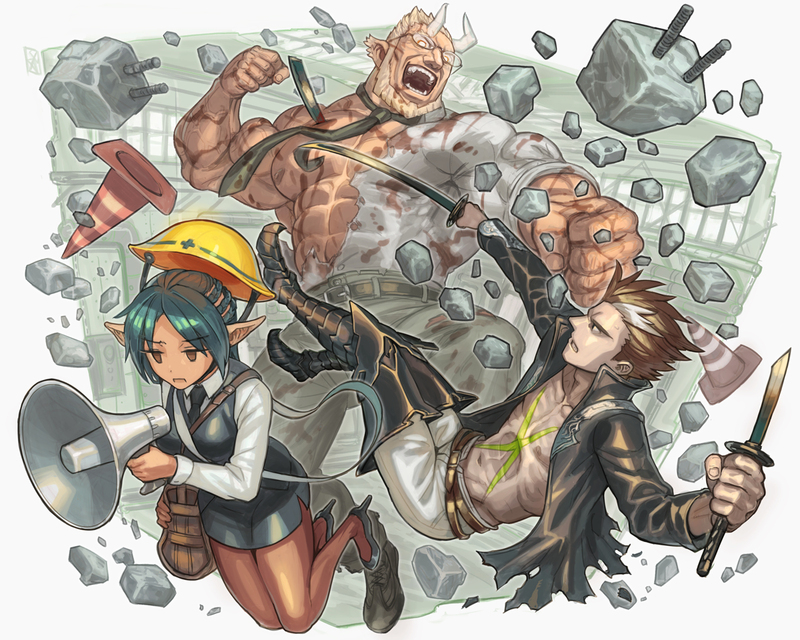 And I get the feeling that the adventures of a long suffering Dark Elf PA and her Oni boss would be quite hilarious. So, what did you guys think of Yamamoto-sensei’s art? Let me know. I love the concept of modern day meets fantasy. But it’s rarely touched upon sadly. Even when it’s such tropes, it’s usually dominated by humans. That said, of his three main scenerios, I love the first and third the most. Yeah, me too. It is just me, but the High Elf Ojousama and her Man-Fox butler working mysteries just has a strong appeal. And I can a bit of humor added on the side. The third with the mayor and the Dark Elf PA feels more like a comedy series with action on the side. And that appeals to me as well. Wow, be awesome to have seen them in manga form. Thanks for sharing us this, Astro! Did you check out Yamamoto-sensei’s Pixiv site? He does have a few 3-4 page manga chapters for the three main character sets. A link would help, I’m not so hip on that website. I had the link in the kanji spelling of Yamamoto-sensei’s name, but I forgot to point it out in the article. ^_^; Sorry about that. Yes! Art first, story second, and this looks really good. I’d even follow this because it appears that the author doesn’t take everything too seriously, which is the best approach to extra-real worlds.